When planning this trip to Hawaii, my husband wanted to try to find hotels that he thought would be suit his family. He had already warned his family that Oahu wouldn’t necessarily be a location that they would love. In fact, he figured they might not like it at all. It’s too touristy, it’s too crowded, it’s not a place where you really see what the locals do and where they go, there’s not a ton of history and culture, etc. But, the fact of the matter was that Pearl Harbor was on the list of “must see” items for this trip, and if you want to see Pearl Harbor, then you’ve got to deal with Oahu. I believe that’s exactly what my husband told his mother. So, to make it a little bit easier for his family, my husband wanted to make sure that the hotel experience was as pleasant as could be with some amenities that he figured they might enjoy. My husband’s parents are big breakfast people. They need to start their day with breakfast to fuel the rest of their daily activities. So it was important that wherever we stayed provided with my in-laws with breakfast options. A couple of years back, my husband and I vacationed in Denver with his sister and her husband, and we stayed at a hotel that had a special lounge on the top floor which provided a place to hang within the hotel, a hot breakfast in the morning, evening hors d’oeuvres with drinks, as well as access to bottled water and sodas for the day. My sister-in-law mentioned several times that she and her husband really enjoyed having this space. My husband and I enjoyed the lounge as well, not necessarily as a space to hang out, but the fact that there were meals, and snacks and drinks! 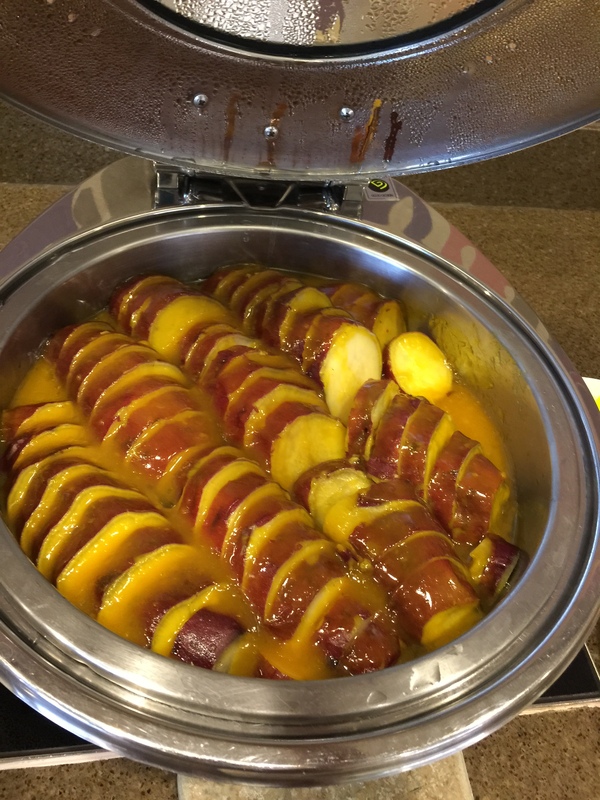 Keeping all that in mind, we were reasonably sure that the hotel we had selected in Waikiki for our stay on Oahu would suit everyone’s needs, as much as we could accommodate what everyone wanted. This particular hotel had a beautiful lounge on the top floor called the Leahi Club Lounge. Leahi is the Hawaiian name for Diamond Head, the volcanic crater that looms over Waikiki beach. 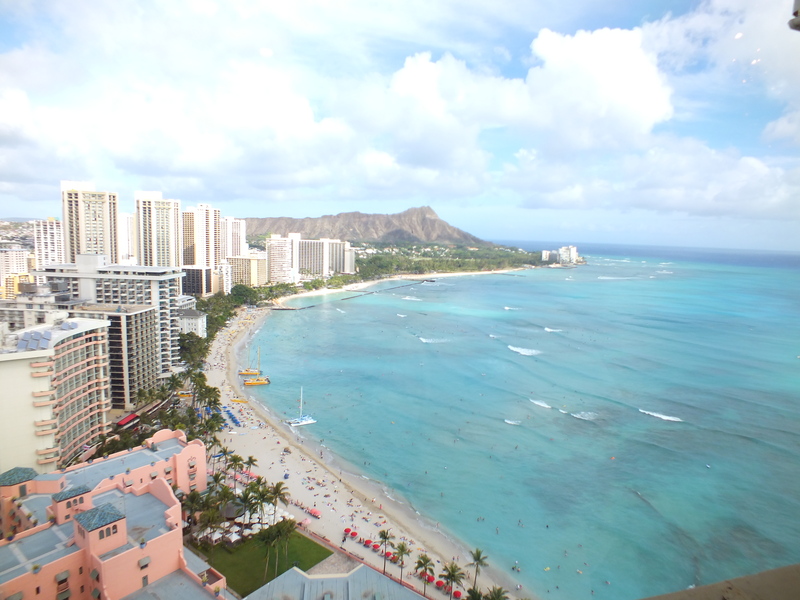 From the lounge, you get an unobstructed view of Waikiki Beach and Diamond Head. The lounge offered hot breakfast every morning, which would make my in-laws happy, bottled drinks and sodas for the day, which makes me happy, a hang out space for people to use, and then evening hors d’oeuvres with drinks to tide people over at dusk. 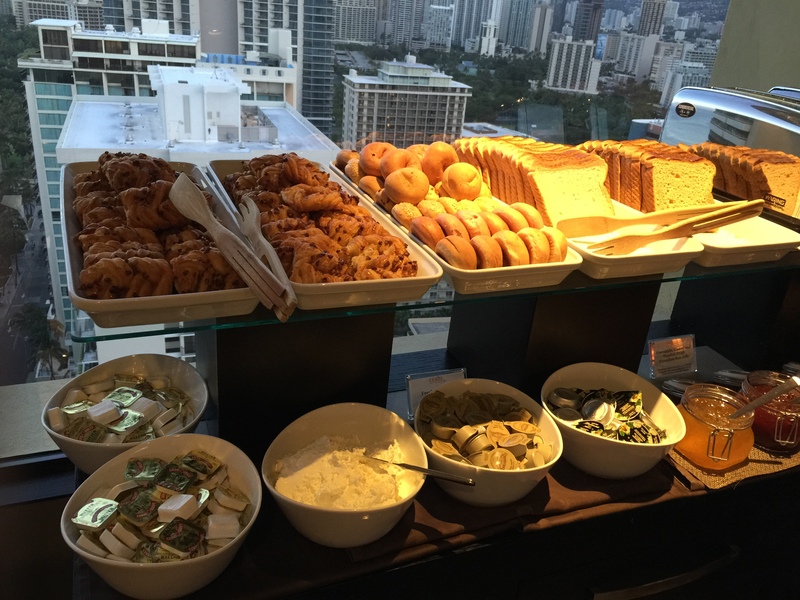 As we arrived in the afternoon on our first day in Oahu, we were just in time for some afternoon hors d’oeuvres. Having missed lunch traveling from the Big Island to Oahu, my husband and I weren’t about to miss a chance to grab a couple of snacks before dinner. One of the things that guests really take advantage of, and enjoy, during evening hors d’oeuvres is the available selection of drinks including white wine, red wine, and assortment of bottled beers and canned sodas for those of us who don’t drink. 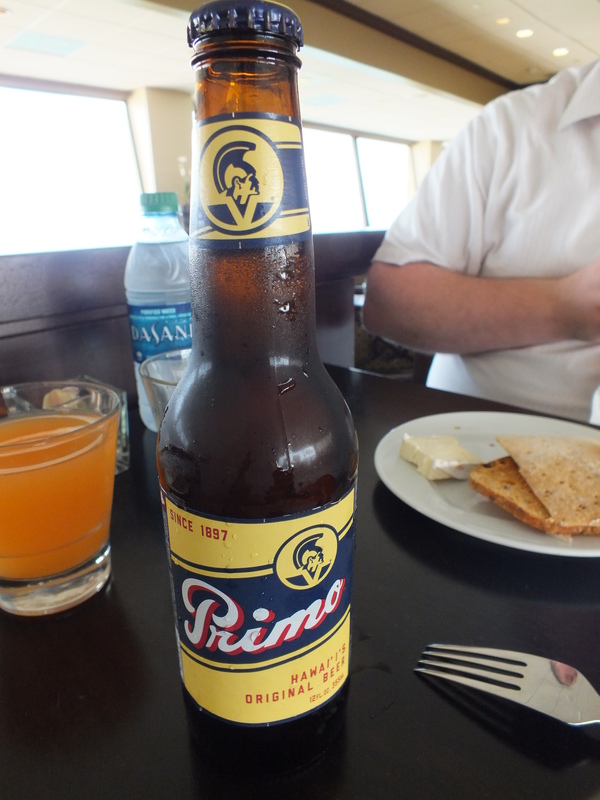 My husband discovered a Hawaiian beer, Primo, that he’d never heard of or tried before, so he had to give it a try just to see what it was like. He wasn’t impressed with it, but it was also a pale light beer which isn’t what my husband favors. 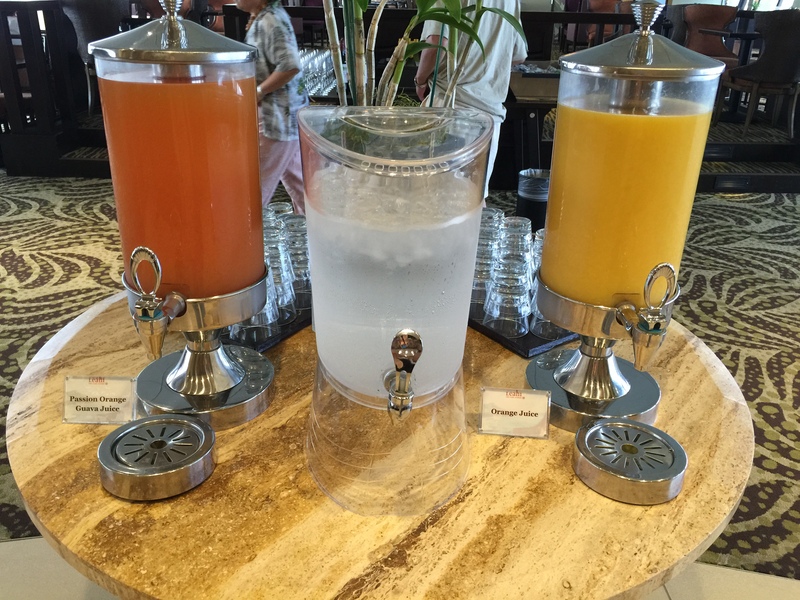 For me, I wanted some of the passion orange guava juice being served. POG, as it’s abbreviated has to be one of the greatest drinks ever made and readily found all over the Hawaiian islands. A little sweet, a little tangy, passion orange guava juice is always refreshing. Ice water and orange juice were also offered as well as a small refrigerator filled with bottled water to enjoy or take away with you for later. My husband headed straight for the cheese platter featuring blue cheese, cheddar cheese, brie, mozzarella, Boursin dill, and caper berry to go with a bread selection of fennel lavosh, taro lavosh, and garlic & olive oil crisps. I’m not a fan of cheese as much as my husband and the rest of his family are, but how can you say no to some cubed cheese and yummy bread as hors d’oeuvres. It’s the universally loved, the world over, snack food. 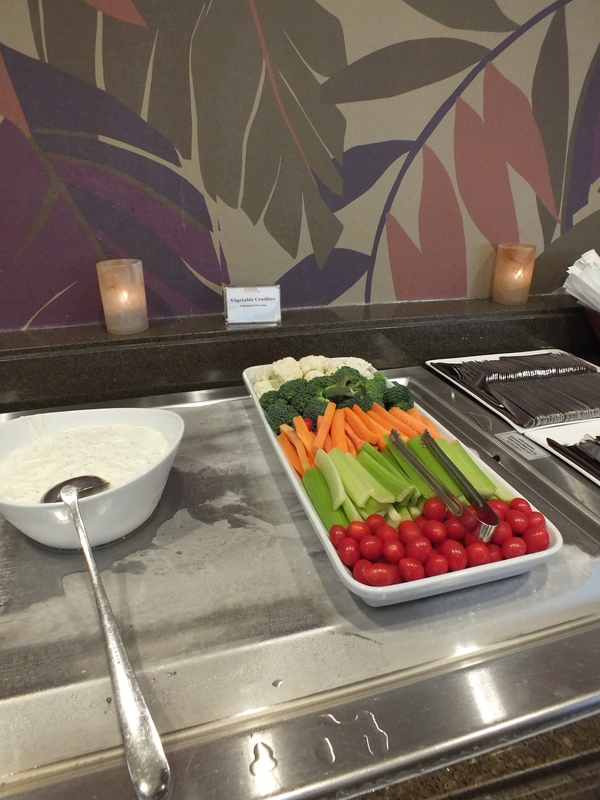 Another cold offering was vegetable crudite with ranch dressing, which is a hit with lots of people and super simple to serve and eat. It also makes for a nice light snack. One of my favorite snacks they put out was the peanut butter and coconut red bean mochi. 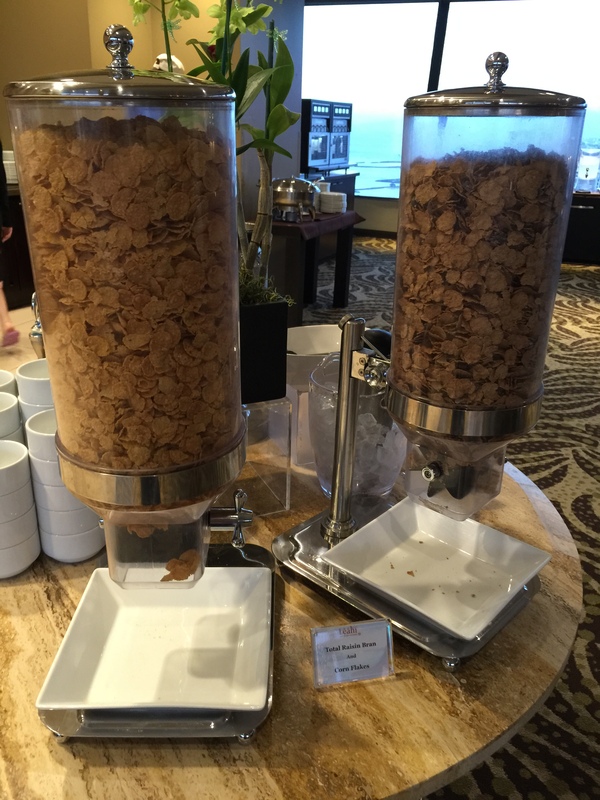 I assume this was a snack designed to appease the hotel’s high number of Asian, specifically Japanese, guests. Mochi is a Japanese rice cake, and in this case with a filling encased inside. The purple-colored mochi on the left had the coconut red bean paste inside, and the white one on the right had the peanut butter filling. I ate quite a few of those coconut red bean mochi. 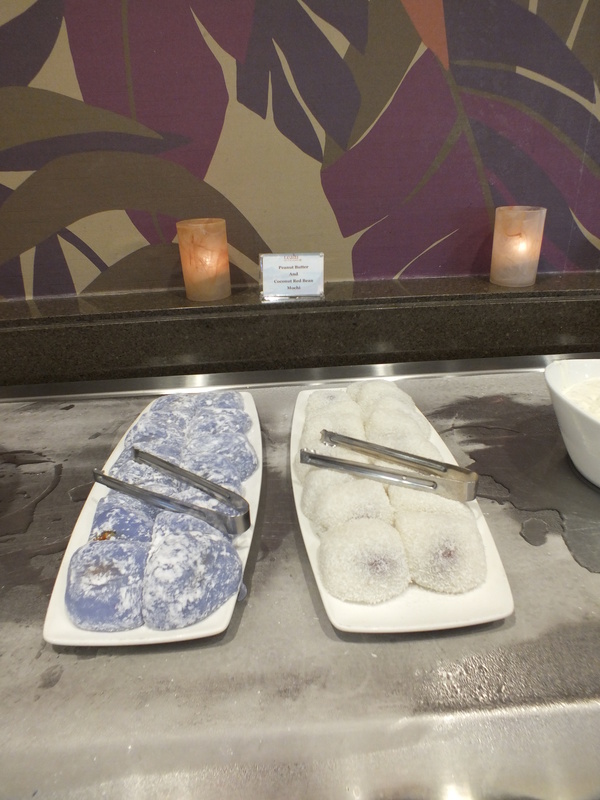 A good, or bad thing, depending on your opinion, is that the snacks offered change on a daily basis, so I was disappointed to show up on the afternoon of Day 2 at this hotel to discover that they weren’t serving mochi that day. But, not to worry, they did bring it back one more time before we left Oahu, so I got my fix. But cold snacks weren’t the only thing they offered. Each night at least two hot items were offered. 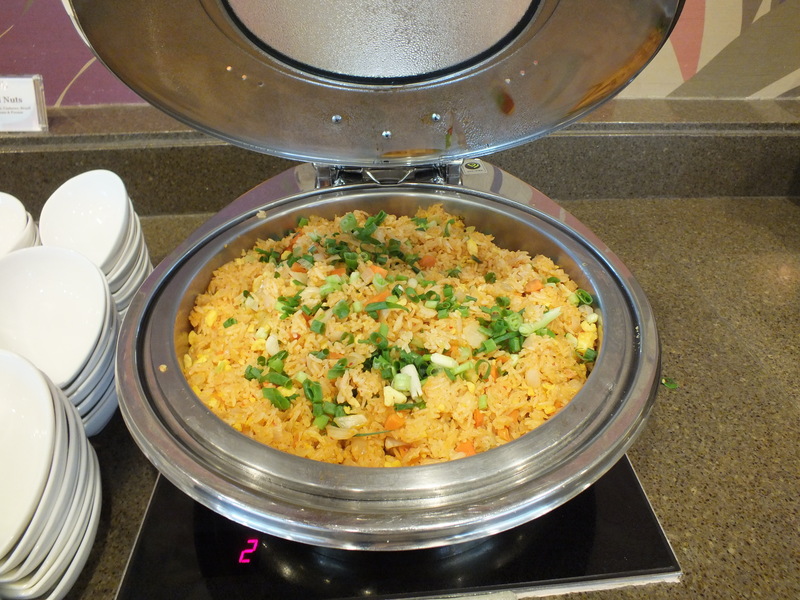 On this particular night, vegetable fried rice was offered, which seemed quite popular. And shoyu marinated chicken was served alongside the vegetable fried rice. You could make a nice light meal out of these hors d’oeuvres. 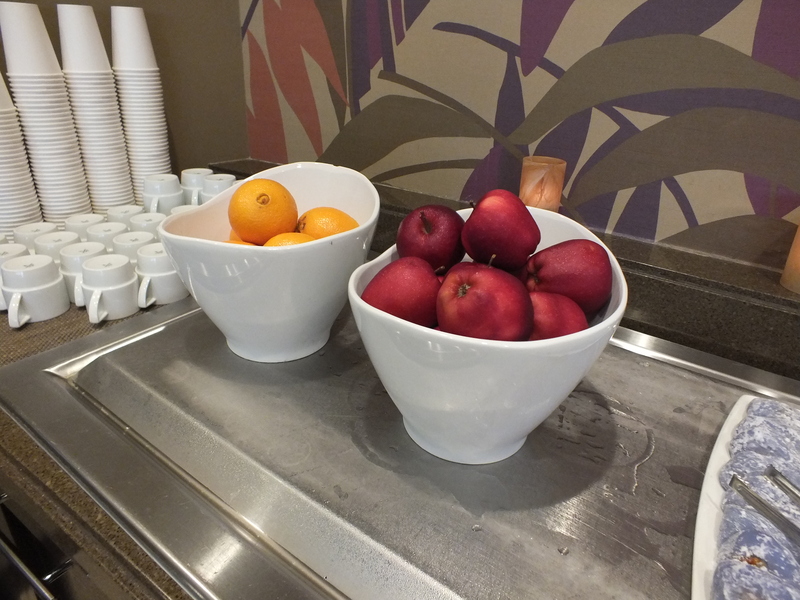 And for those who want something a little healthier, there’s fresh oranges and apples that you can enjoy, or take with you, if you want. The next morning, it was time for breakfast. This was the perfect way for us to fuel up for our day of sightseeing at the Pearl Harbor memorial. 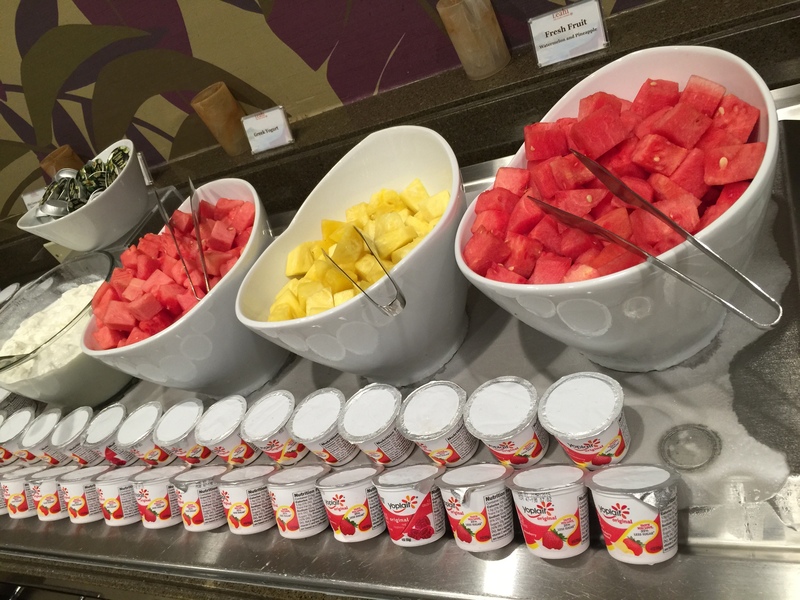 The lounge offered your standard cold breakfast offerings of a couple of different kinds of cereal with milk, along with fresh fruit and yogurt. 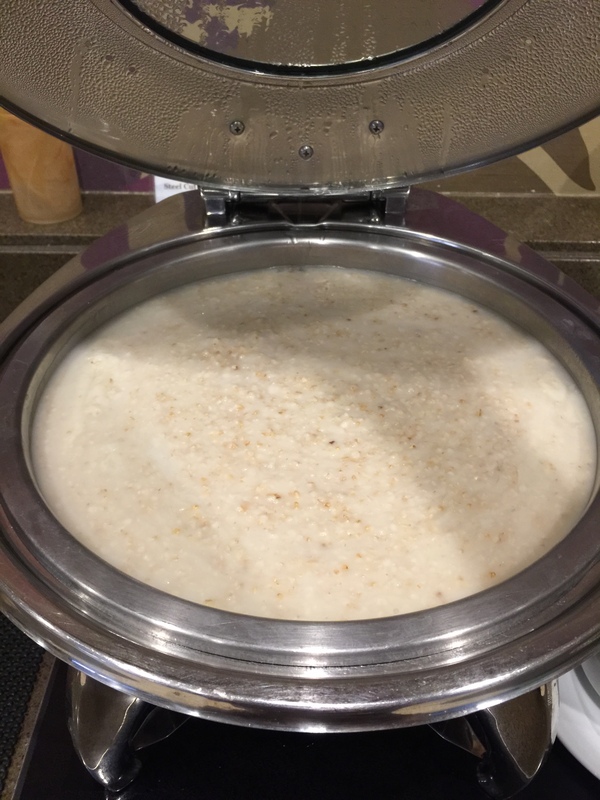 Oatmeal was also offered. There was a bread and pastry area which offered mini pastries (they were so cute!) as well as mini bagels and various kinds of toast. Of course, there were a couple of toasters as well and all of the usual condiments you’d expect – cream cheese, various flavors of local Hawaiian jam, and butter. But what is a real breakfast without some hot breakfast items. 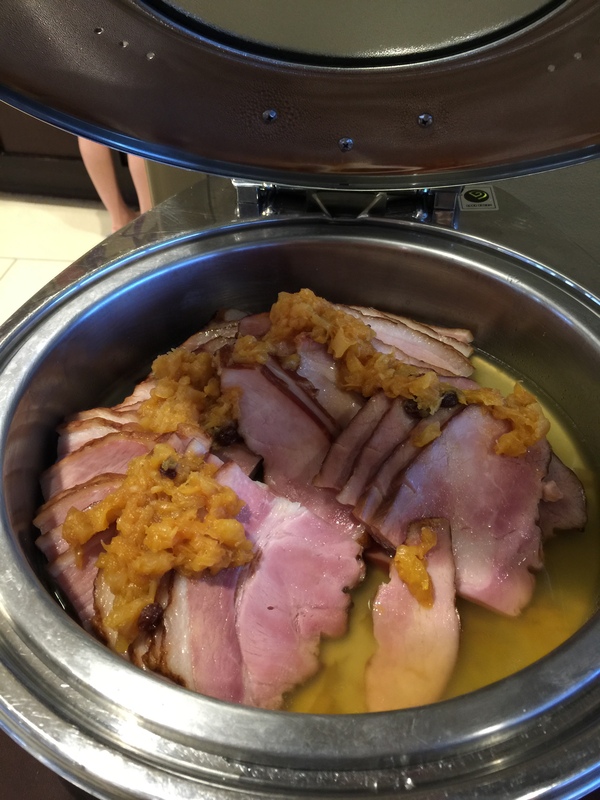 Let’s start with pineapple ham. I loved that and I noticed that others did too as it was extremely popular. And of course, you need eggs for breakfast. 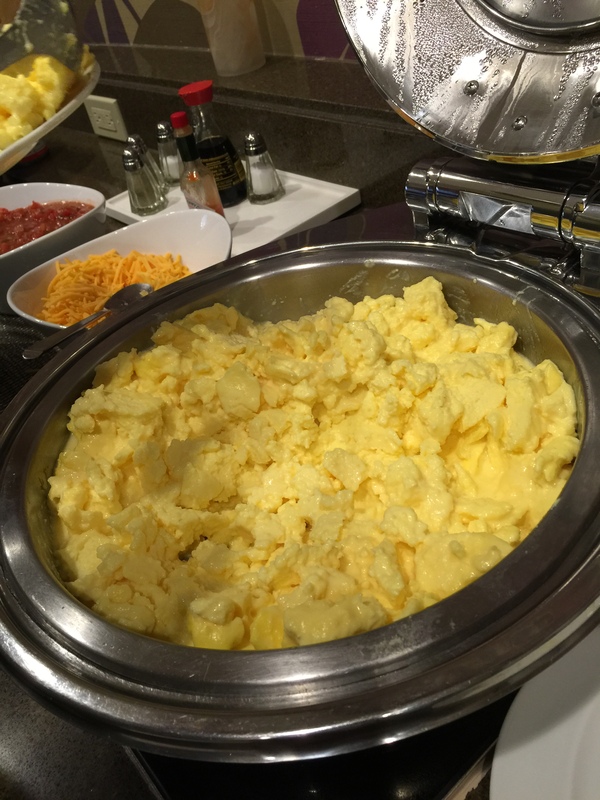 Plenty of scrambled eggs here. Put out some scrambled eggs for breakfast and my husband is a happy camper. 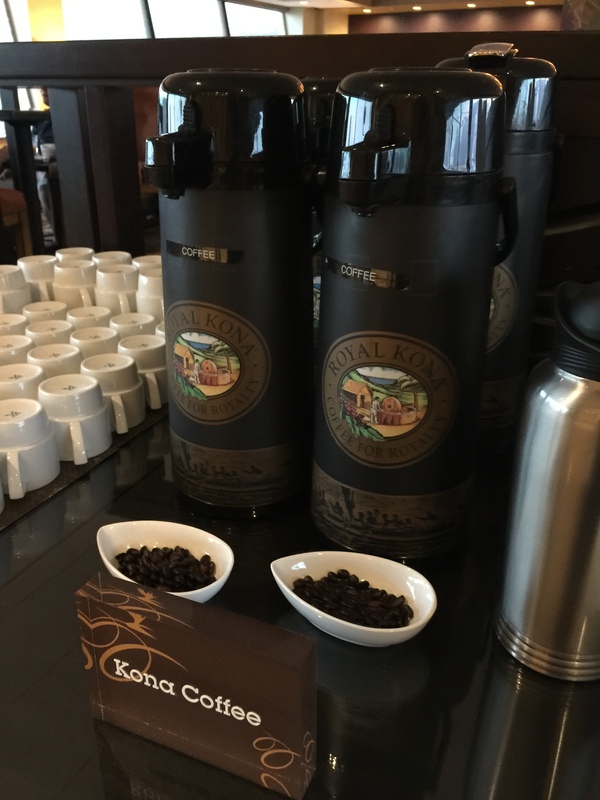 When in Hawaii, you’ve got to serve some Kona coffee for breakfast. A couple of fresh brewed pots of it. And for the pickier coffee drinkers, there was a gourmet coffee machine serving some flavored coffee drinks as well as espresso and cappuccinos. 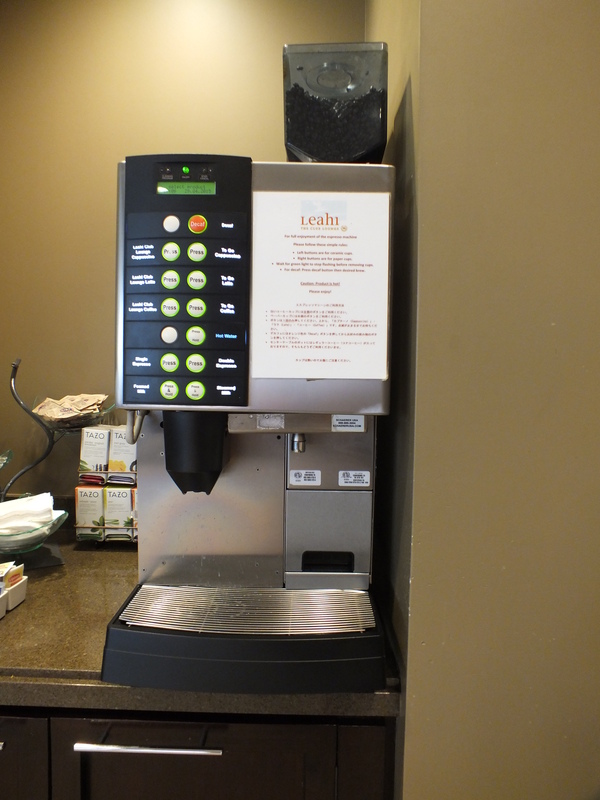 And they also offered to go cups for the gourmet coffee machine so you could grab and go. 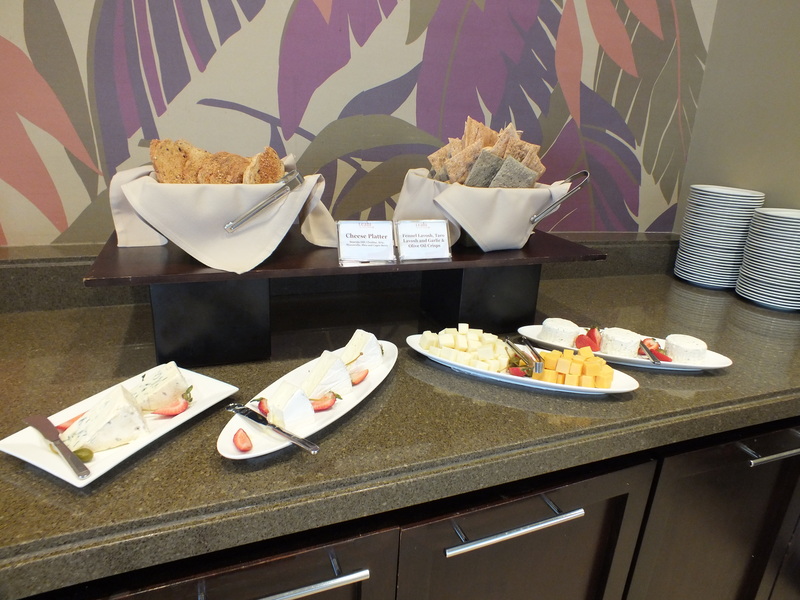 The next evening when we came back to the lounge for hors d’oevures the cheese and the crackers and bread were the same, but the two hot dishes were completely different. This second night they had kau orange glazed potatoes and soy and sake braised beef short ribs. 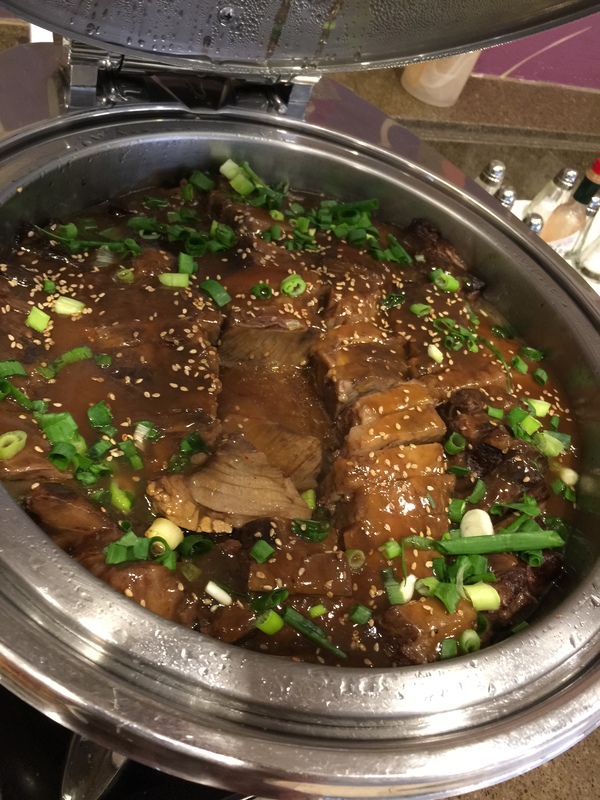 I tried the short ribs and they were quite tasty. For snack foods there was an offering of mixed nuts, as well as cookies. 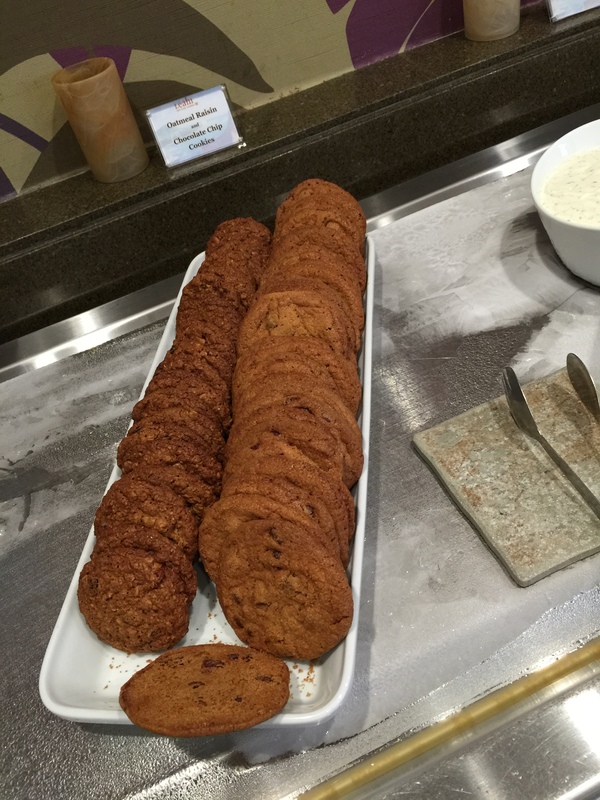 In this case they were oatmeal raisin and chocolate chip cookies. My husband and I had a few of the chocolate chip cookies and really liked them! Quite a good snack. If I didn’t have plans for dinner later, I could easily spoil my dinner by munching away at the chocolate chip cookies. The last evening we were at the hotel the evening hors d’oeuvres changed again and the hot offerings included beef sliders with buns and all of the fixings and tater tots. That’s almost not even hors d’oeuvres, but enough to make an actual dinner meal. I think that ultimately everyone in our party enjoyed having access to the Leahi Club Lounge. 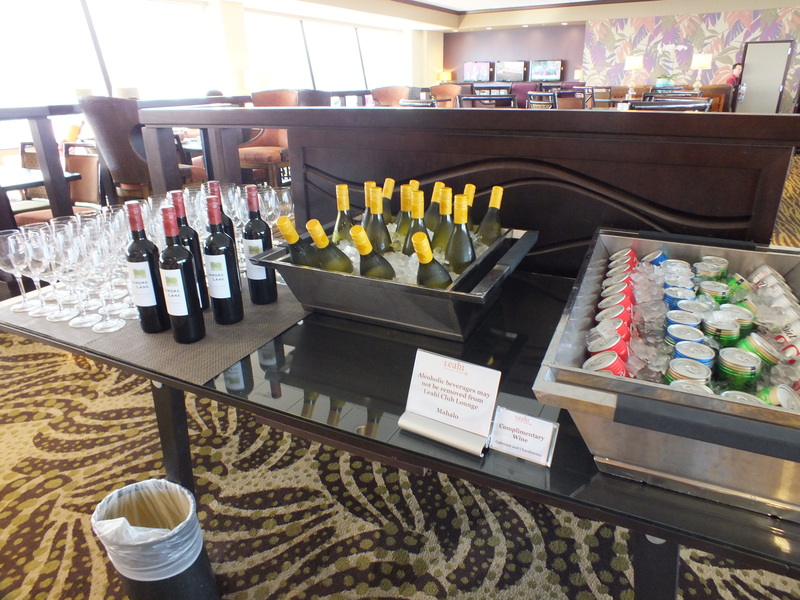 Most of us used the lounge for breakfast each morning, and most of us used the lounge each evening for hors d’oeuvres. 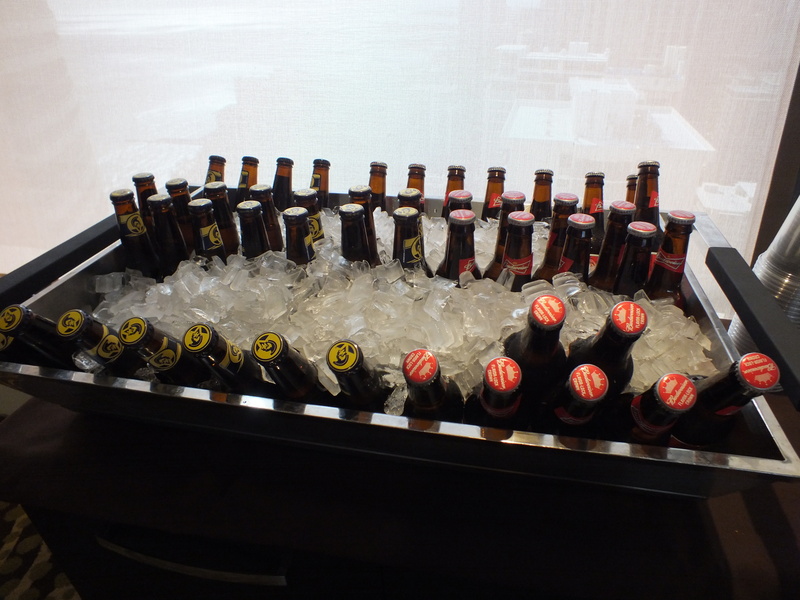 Also, having access to the canned sodas and the bottled water for the day was also beneficial and saved us a couple of bucks from having to go out and load up on drinks. And it’s hard not to sit up in the lounge and just admire the view of Waikiki surrounding us and Diamond Head in the distance. It makes for a great, relaxing atmosphere to enjoy the city, the view and each others company.